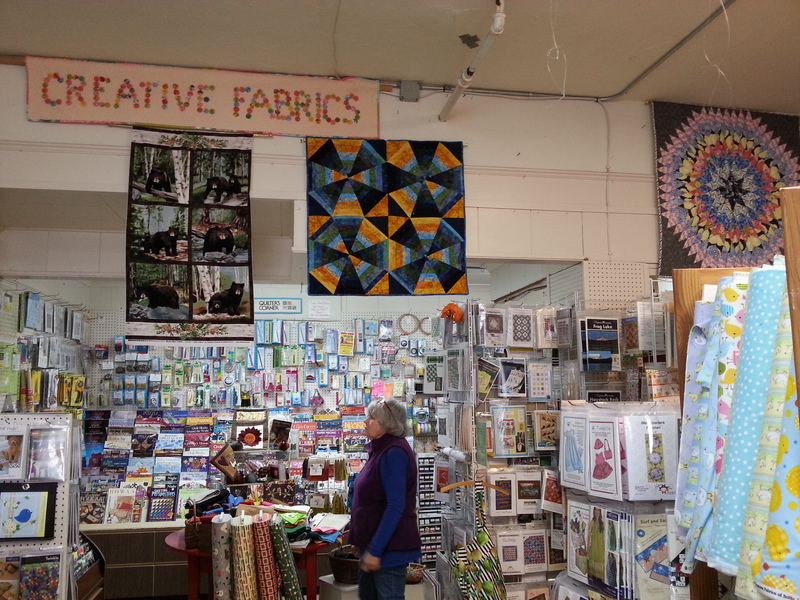 After Quilt Camp at Twin Rocks (OR), my friend Nancy Watts and I headed north up the coast to explore and enjoy the quilt shops. 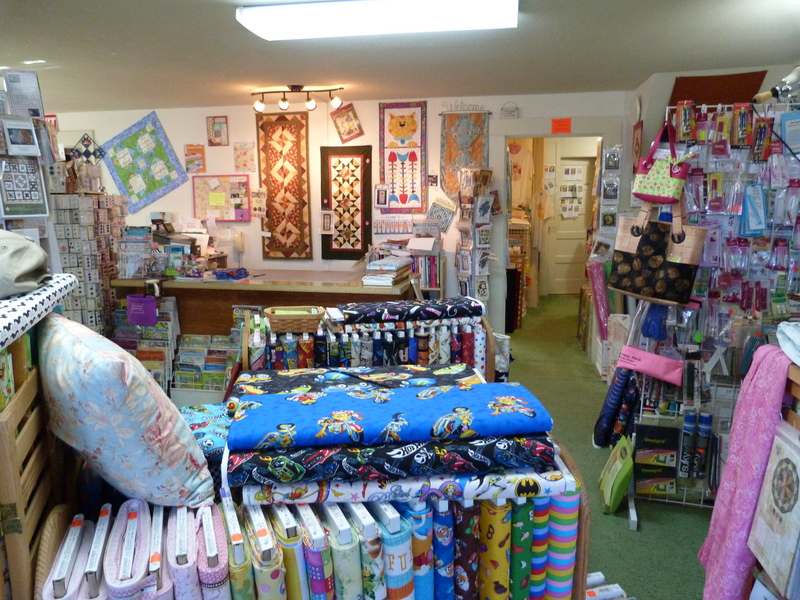 There is a delightful store in Wheeler, Creative Fabrics, housed in the Old Wheeler Hotel building complete with a Quilt Trail (see earlier blog) painted quilt block. 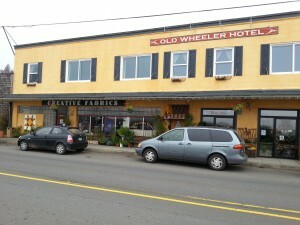 Wheeler is a tiny seaside community of about 350 in a beautiful spot about 25 miles north of Tillamook. 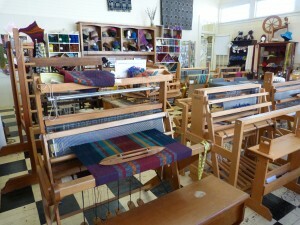 The staff were friendly and welcoming. They had an impressive selection of marine themed fabrics and unusual prints as well as a good number of Kaffe Fassett fabrics. 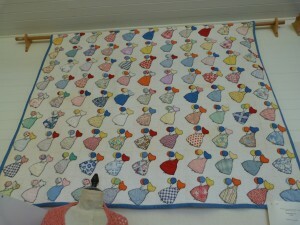 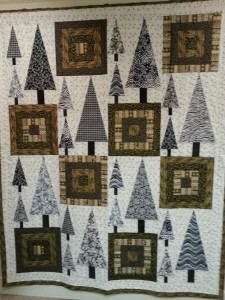 This lovely tree quilt was hanging in the back corridor leading to the restrooms and an adjacent store. 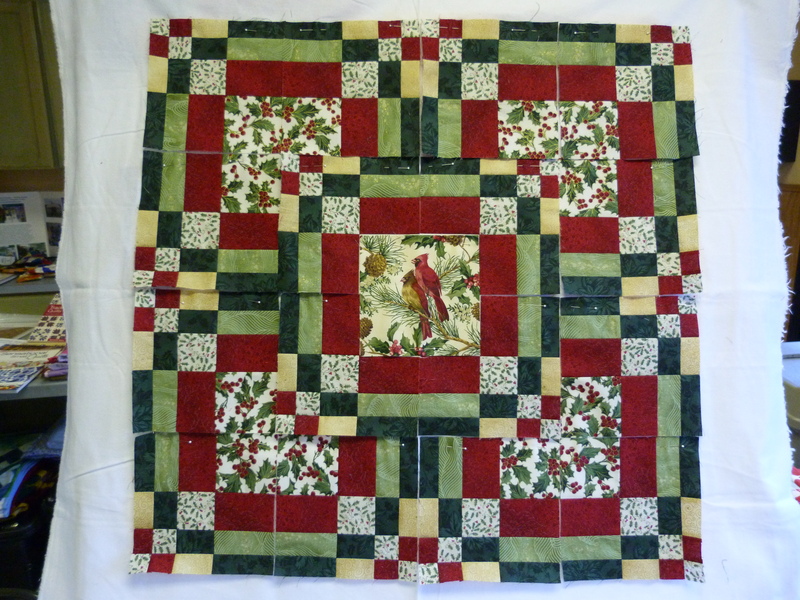 The pattern was a free download from Moda with their Figgy Pudding fabric line. 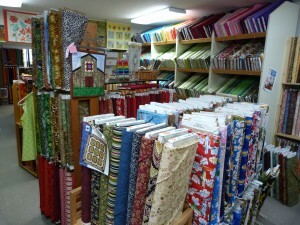 In addition to all the fabric, there was a good selection notions and patterns. 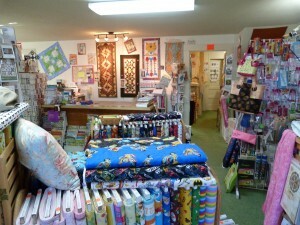 This store is definitely worth the stop and there are also eateries and nice gift shops in Wheeler too. 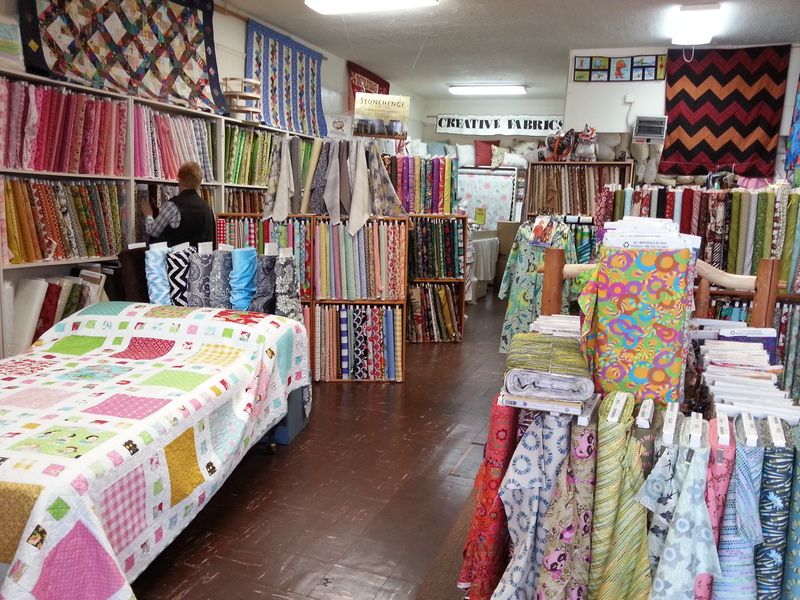 I always enjoy the opportunity to visit quilting shops on my travels. On the way to Quilt Camp (see my previous blog), I visited Jane’s Fabric Patch in Tillamook, owned by Jane Wise our fearless Quilt Camp leader and organizer. This bright pink building certainly stands out! 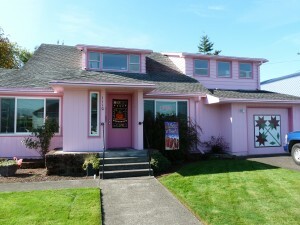 Jane is definitely into pink! 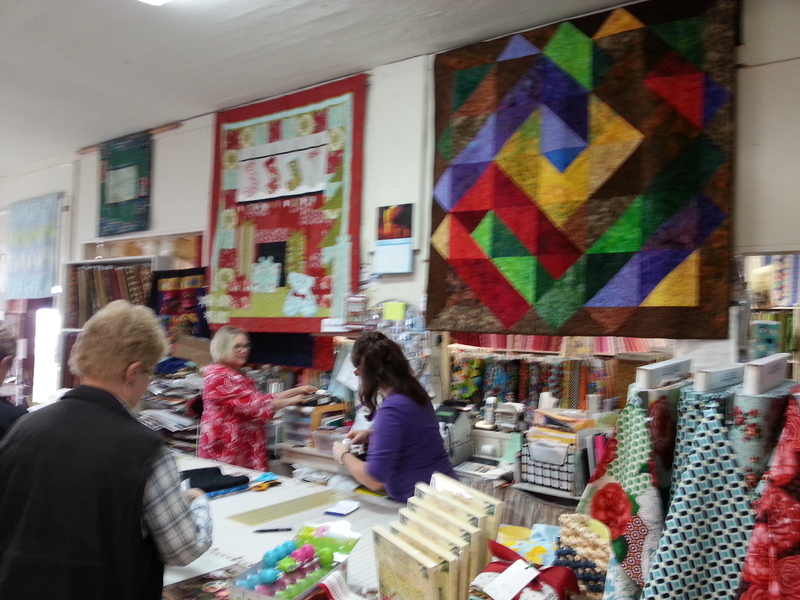 Here’s the book and pattern nook and the large classroom. 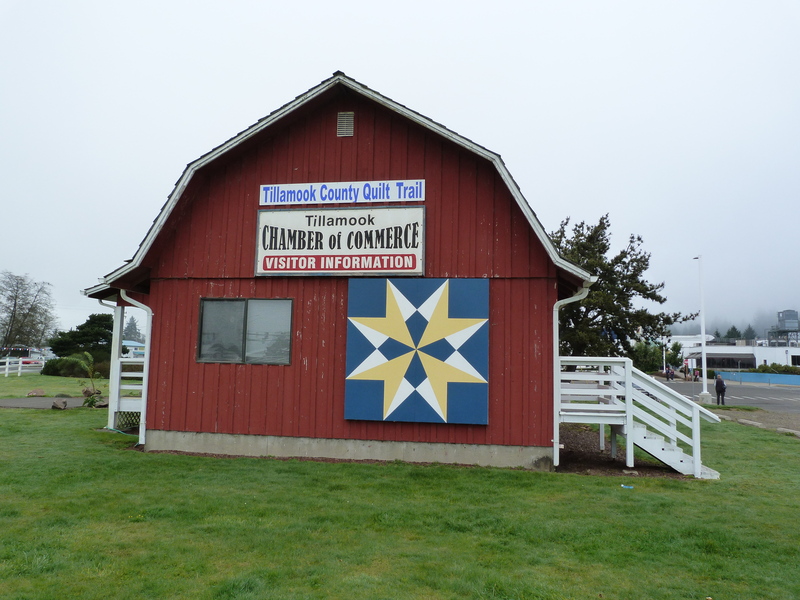 Great fun and well worth a visit along with other attractions in Tillamook such as The Cheese Factory with delicious ice cream and the Latimer Quilt and Textile Center. 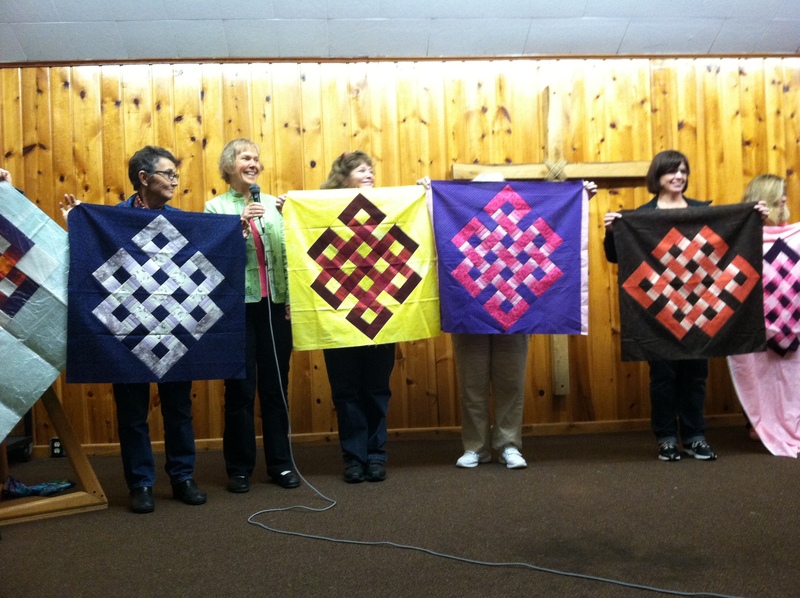 In October I had a wonderful time teaching at Quilt Camp at Twin Rocks on the OR coast. 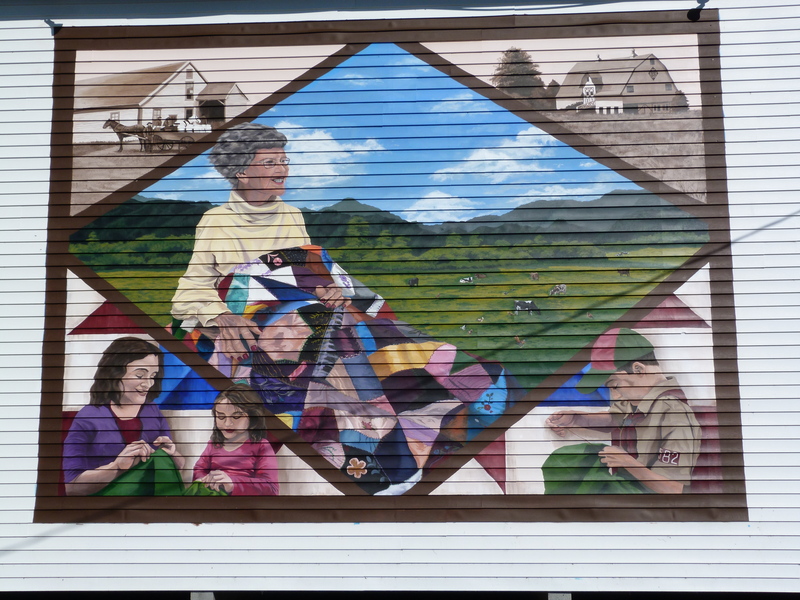 En route I had time to explore a little in the Tillamook area and was delighted to see many quilt blocks painted on large boards hanging on buildings. 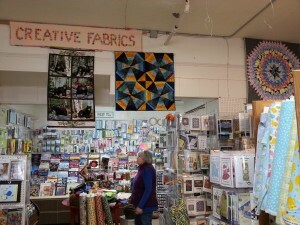 The Quilt Trail concept is very popular in the East where there are around 3,000 quilt blocks mounted on barns and businesses. The nearest to Tillamook is in Nebraska. 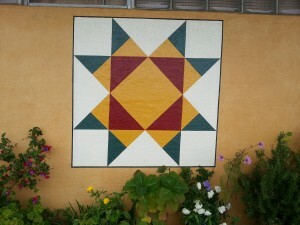 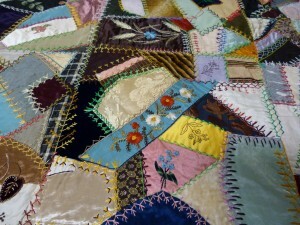 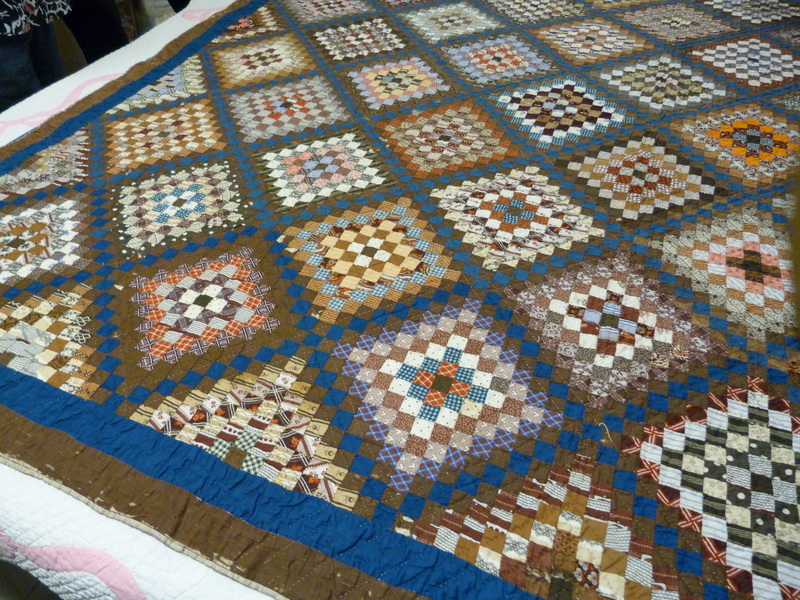 The Tillamook Quilt Trail began in 2009 with 13 quilt blocks. 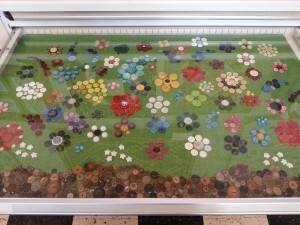 Each year, more have been added and there are now over 45. 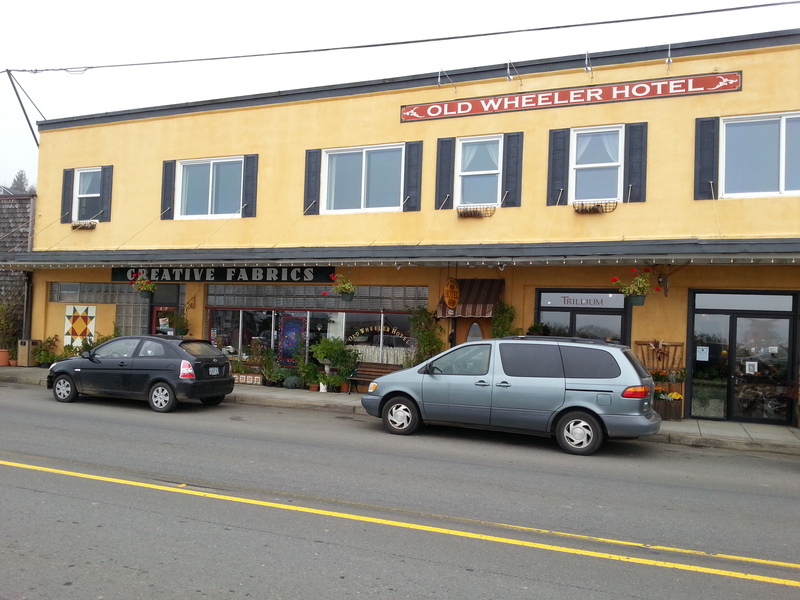 On the left we have the one displayed in Wheeler just north of Tillamook on the Old Wheeler Hotel building which also houses Creative Quilting, a nice quilt shop. 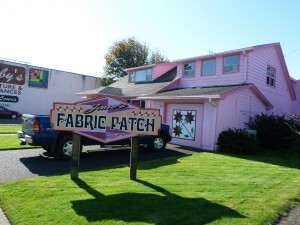 On the right, Jane’s Fabric Patch in Tillamook has a lily block and there is one on the side of Roby’s Furniture and Appliances too. It’s fun to watch out for these quilt blocks and see how many you can spot as you drive through or walk around Tillamook. 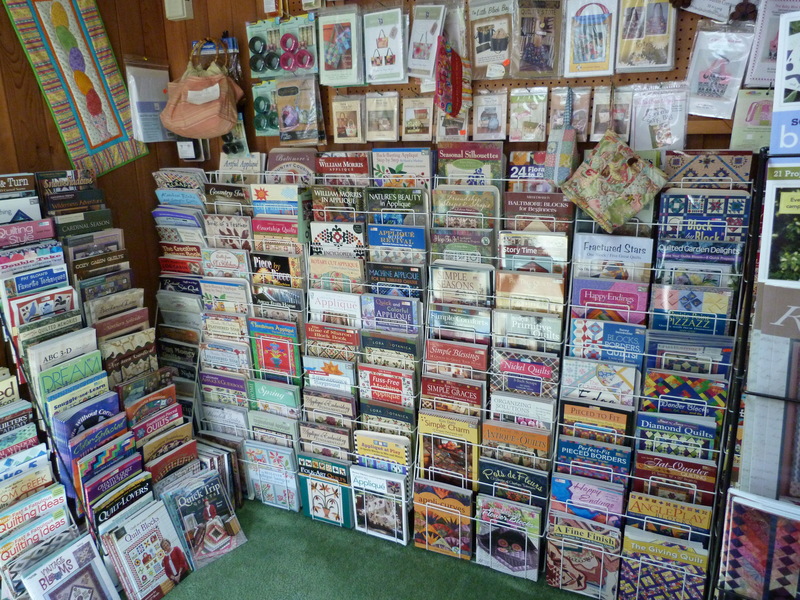 Brochures listing the location of all the quilt blocks are available at the Visitors’ Center and at the Latimer Quilt and Textile Center. 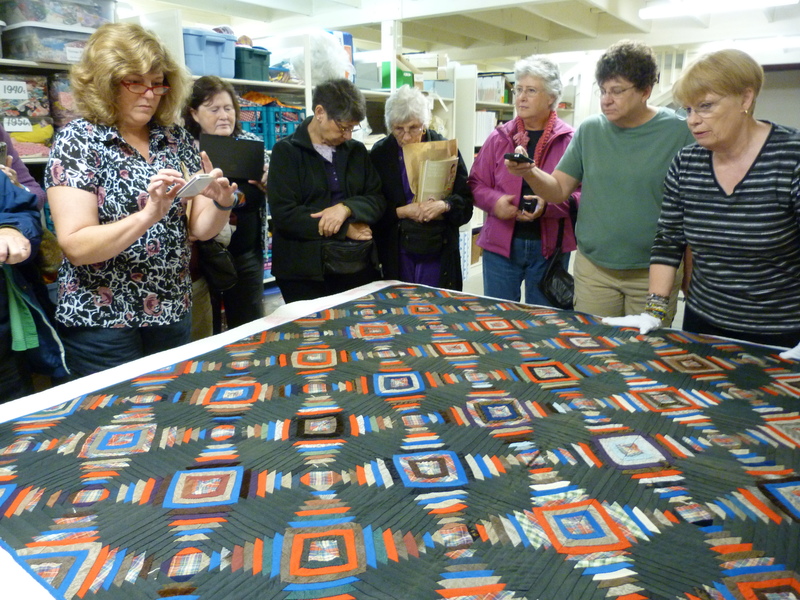 When Nancy Watts and I visited the Latimer Quilt & Textile Center before Ocean Waves Quilt Camp, (see last blog), we discovered that if we gathered together a group of six people, we could have a guided tour through the climate-controlled repository. 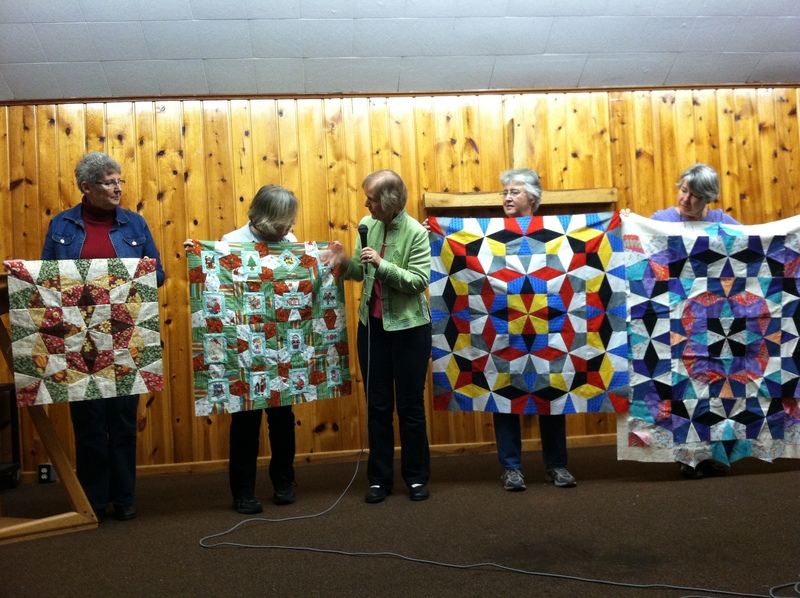 We decided that we would easily persuade six people at Quilt Camp to come the morning we were all to head for home at the end of Camp, so we went ahead and made the arrangements with the Center. 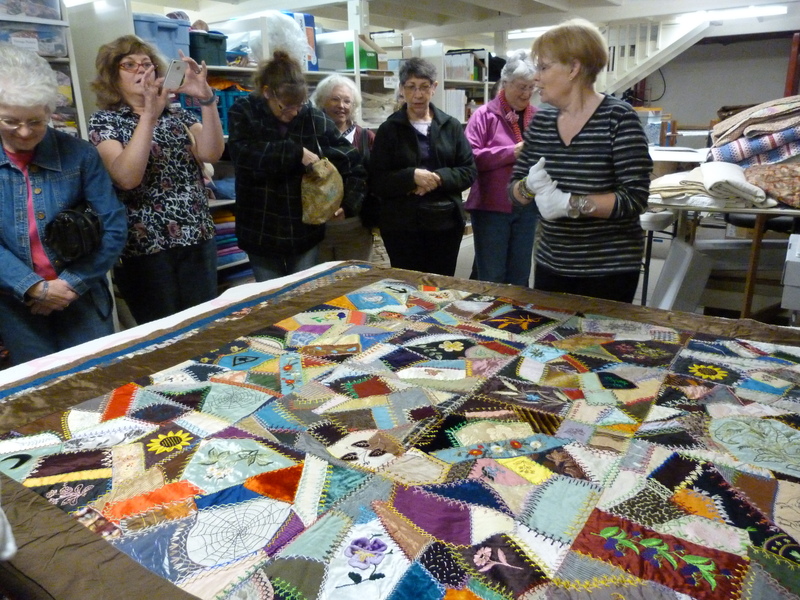 Over 20 people from Camp came so we had two shifts for the tour of the repository where there are over 160 quilts and quilt tops stored along with vintage fabric collections and antique textiles of all kinds. 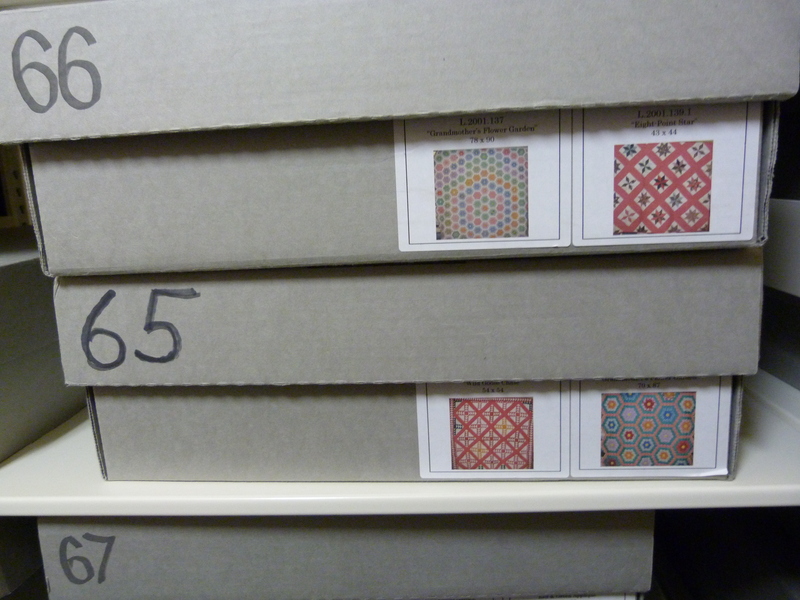 The quilts and quilt tops are all stored in acid-free boxes carefully numbered and labelled with a picture for ease of identification. 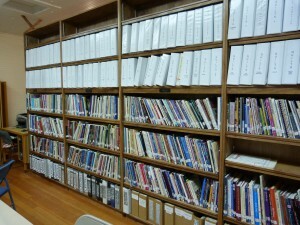 There are a series of huge shelving units that roll on a system of rails and everything is very well organized. They also have a bed with some antique quilts stored flat and we were privy to a bed turning. 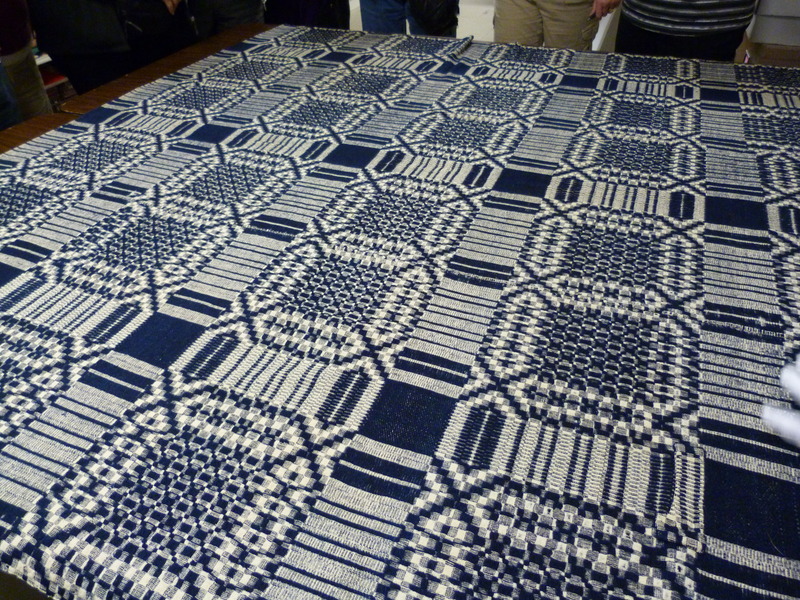 The woven cover dates from the 1850s. 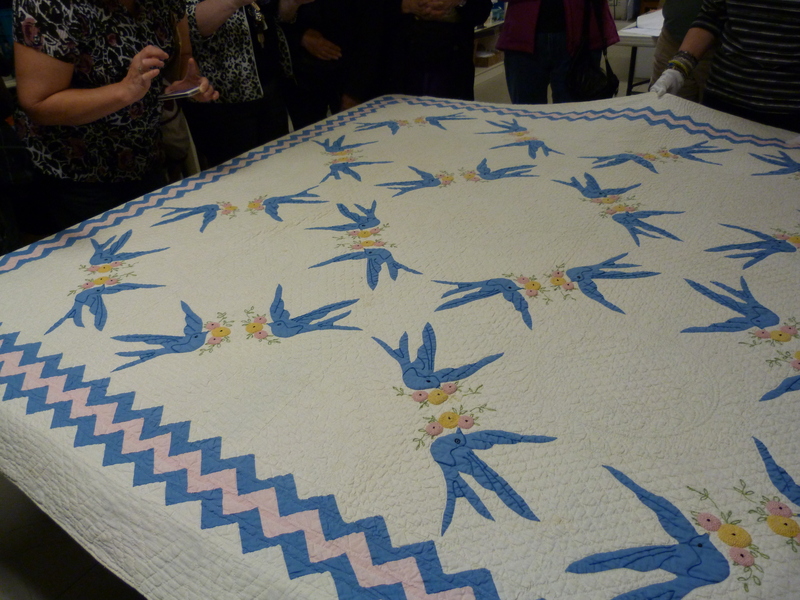 This beautiful Crown of Thorns quilt was hand pieced and hand quilted by Ella Jones, aged 16, in 1883. Here’s a spectacular crazy quilt from 1898. 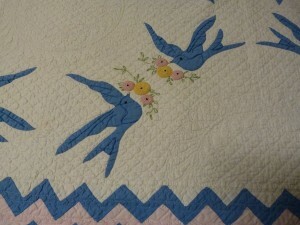 The embroidery was wonderful and as we looked, we kept seeing more delightful details. 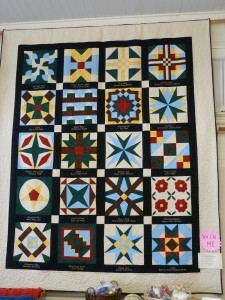 Finally, a beautiful applique quilt with fine hand quilting. 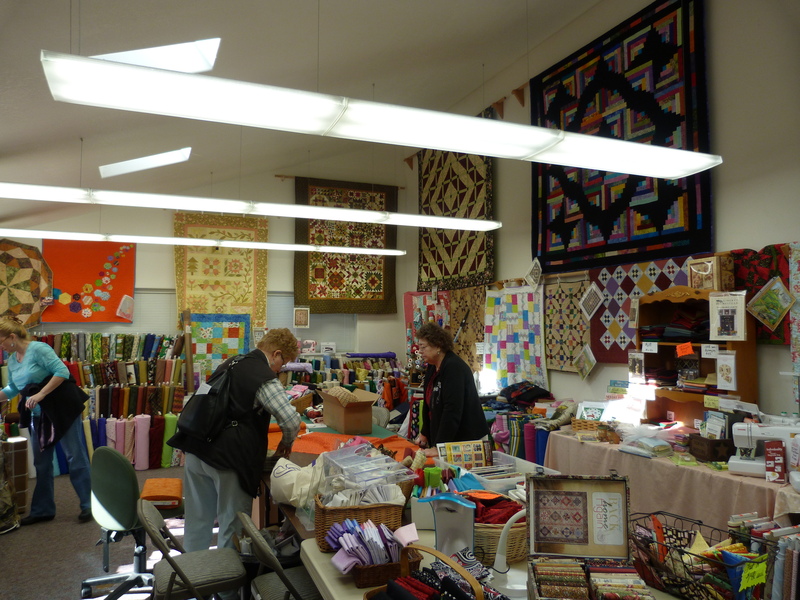 I was fortunate to visit the Latimer Quilt & Textile Center near Tillamook when I went to teach at Ocean Waves Quilt Retreat on the OR coast. This is a gem of a place and a great quilting resource. 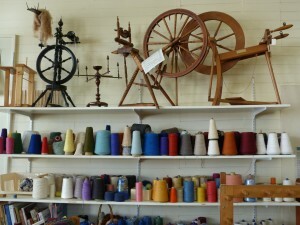 Visiting should be a high priority if you are in the area. The Center began as a school, built in 1900 on a parcel of land donated by James and Permelia Latimer in 1892. 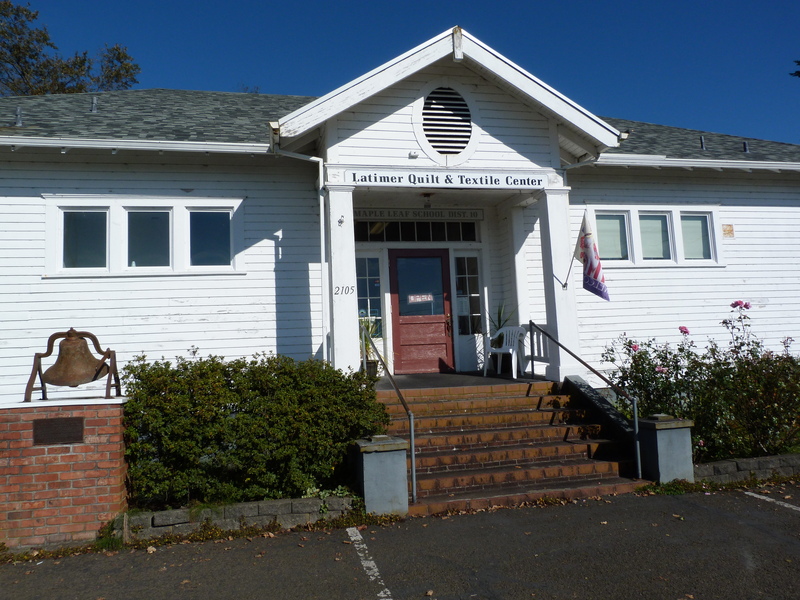 The current building dating from the 1930s, became a maintenance repair facility in 1959. 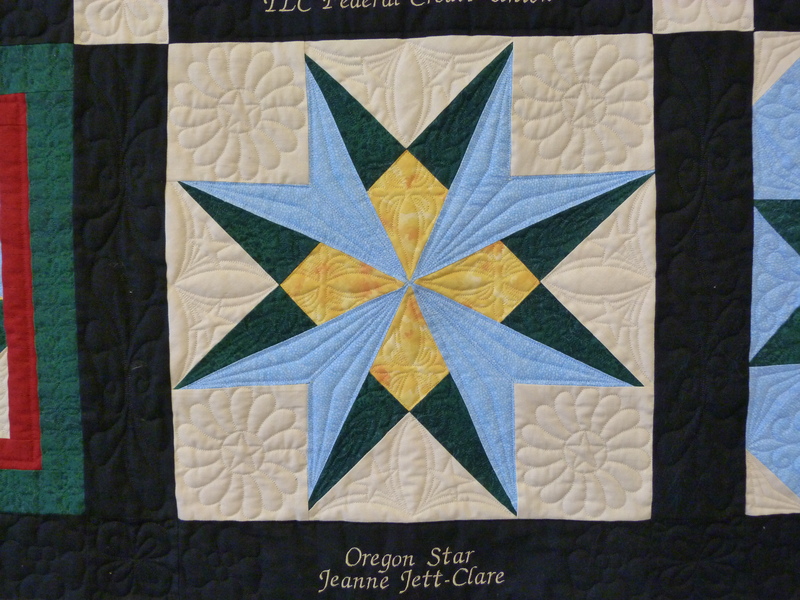 Thirty years later the property reverted to the Latimer family who then donated it to the Tillamook County Pioneer Museum Foundation in memory of James and Permelia. 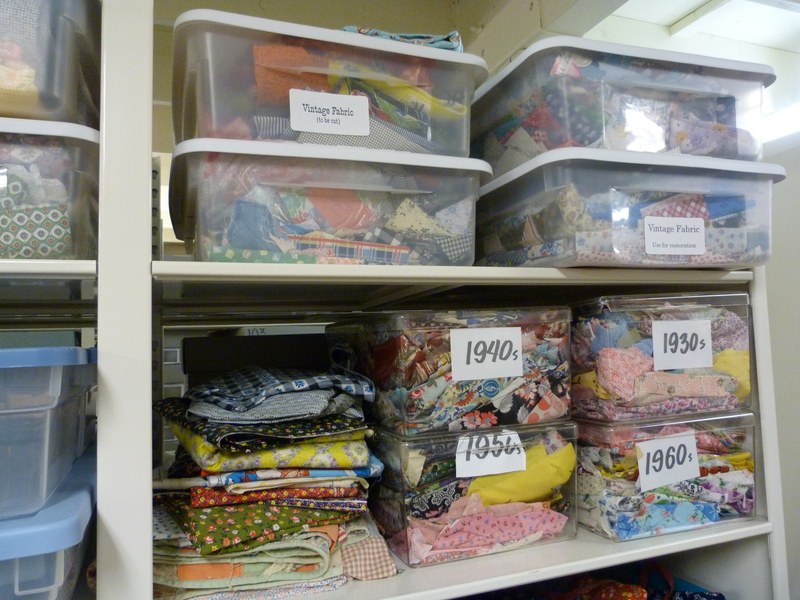 Claire Fairfield, an employee of the Museum, saw the need for a textile center in the Pacific Northwest; a place for artisans to demonstrate, teach and produce their crafts. 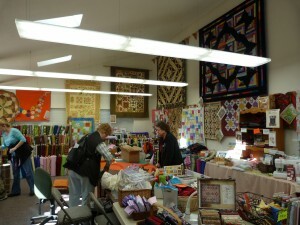 The Center has become this place and hosts many craft activities. 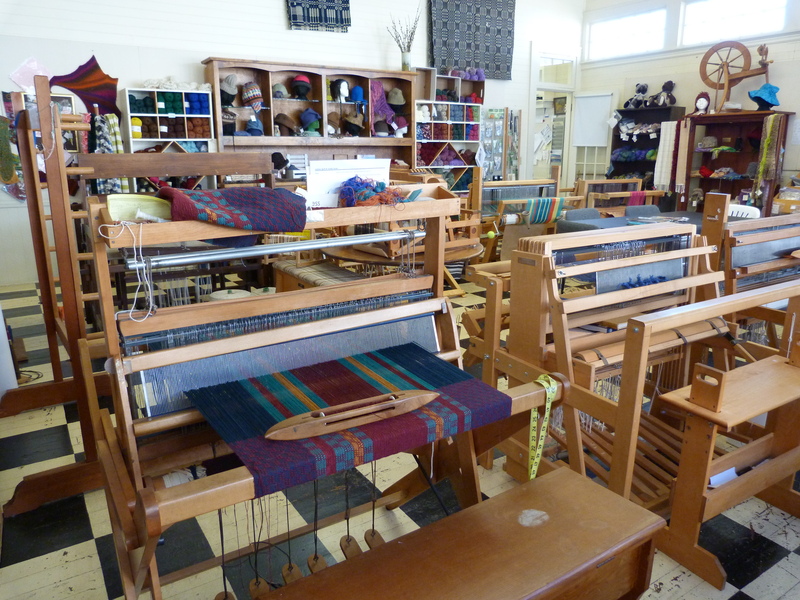 There is a large room devoted to spinning and weaving. A sizable area houses special visiting exhibits including quilts and other fiber arts. 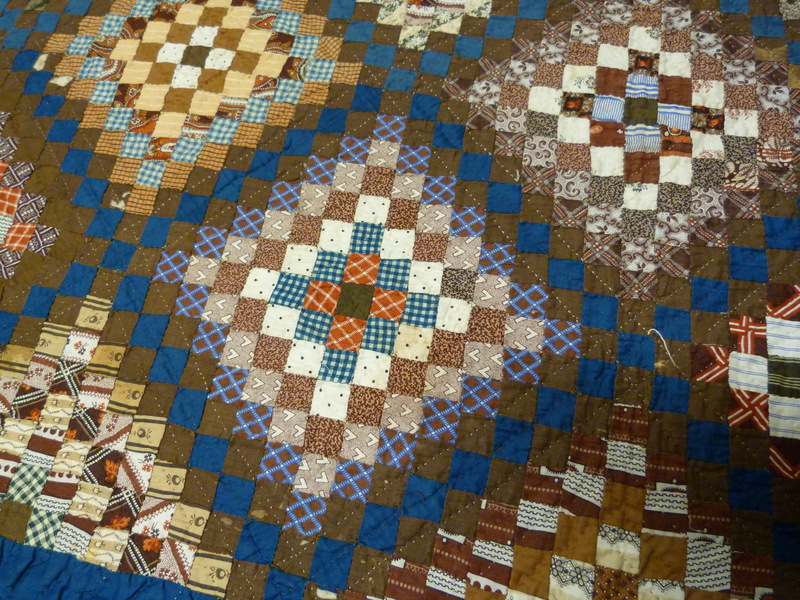 When we were there the Whidbey Island Surface Design Association had an eclectic show entitled Life on the Edge which included some facinating 3-d pieces. 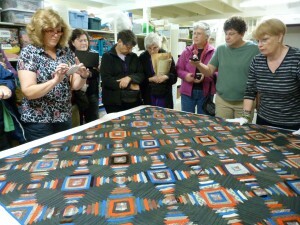 In another large room that can be used for workshops, antique quilts from the permanent collection are displayed on the walls. The lovely Lone Star (c.1930) was donated by Al Griffin and the Sunbonnet Sue (c.1935) donated by Jo Kincade. 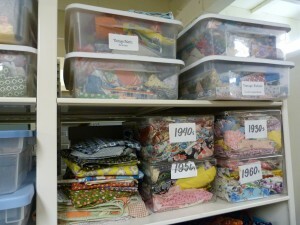 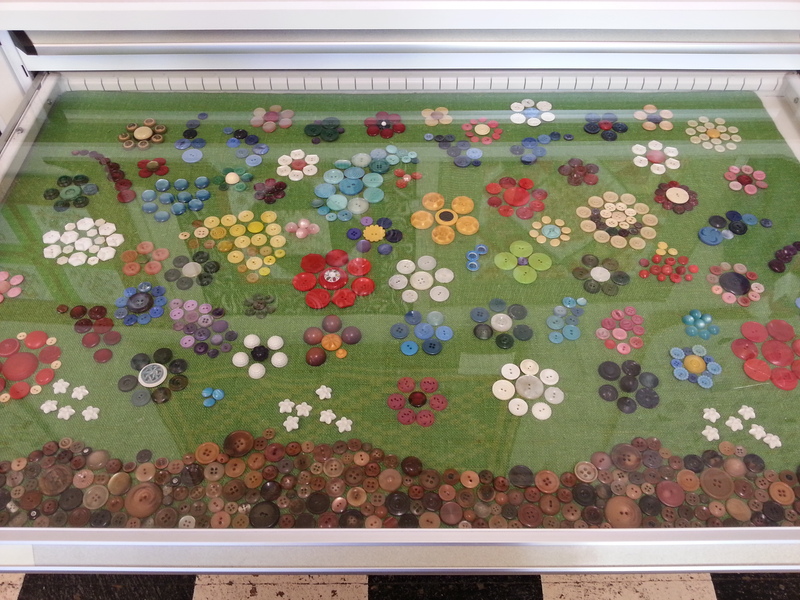 Also in this room were wooden cabinets with display drawers containing all kinds of interesting quilt blocks, embroidery, beading, lace work, buttons and more. 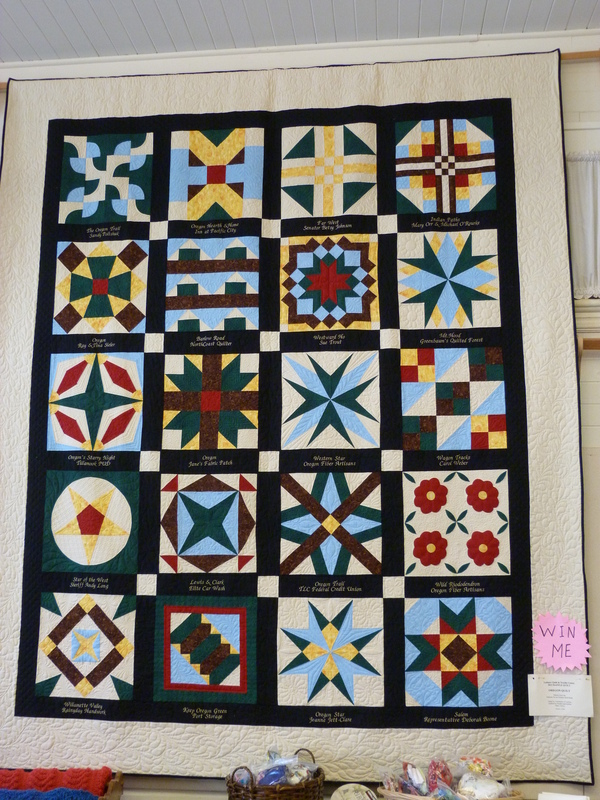 The beautiful 2013 raffle quilt was on display. 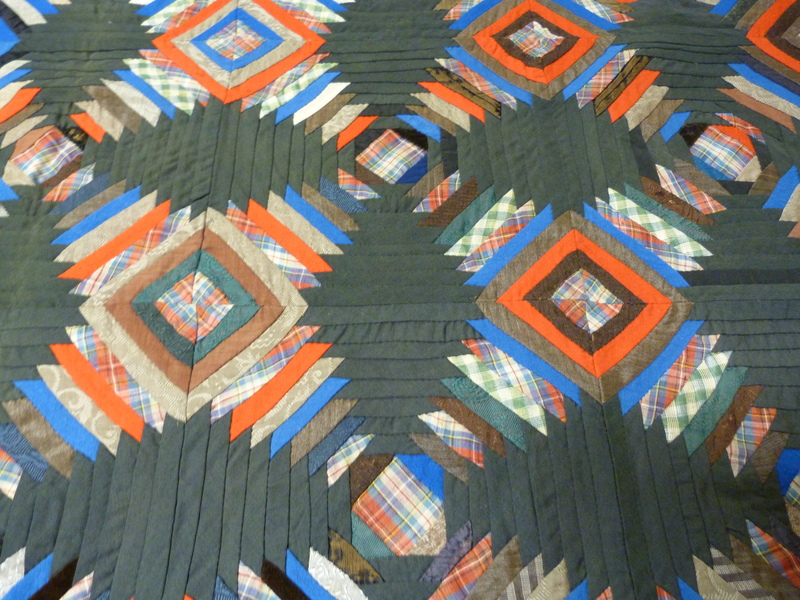 The “Oregon Quilt” was made by volunteers at the Latimer Center and machine quilted by Mary Torrey. 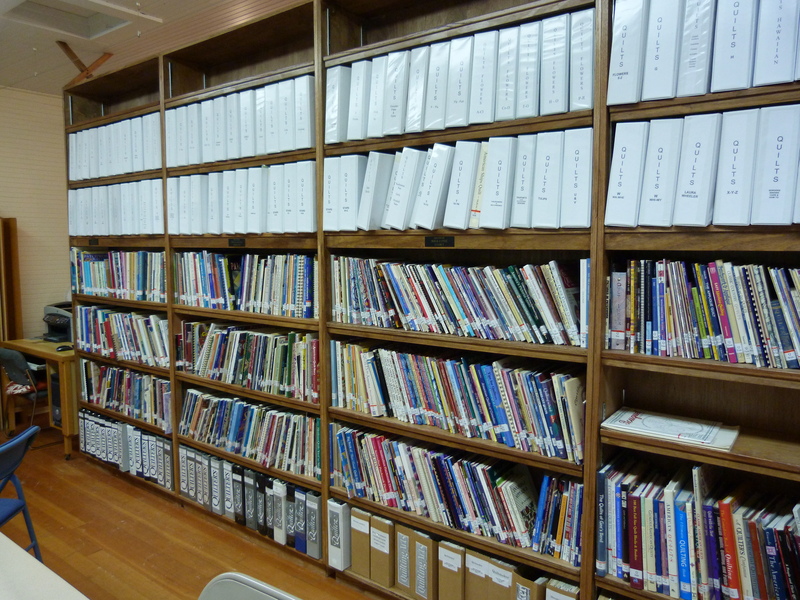 The Center also has an impressive research library with an extensive collection of books and patterns available for on-site research. 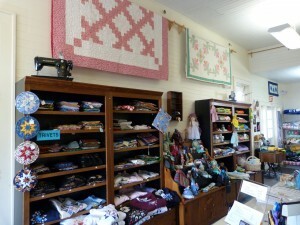 Then there’s the store to help boost Museum funds with all kinds of hand crafted items and more. 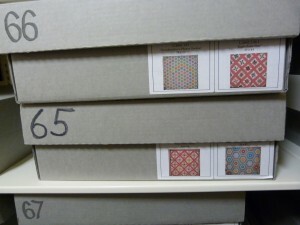 If you have a group of six or more, you can go on an organized tour by appointment to see the climate-controlled repository for the permanent collection items not on display. 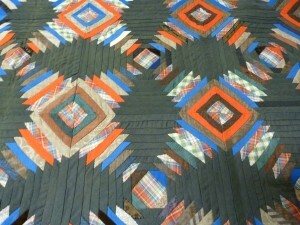 More on this in my next blog. 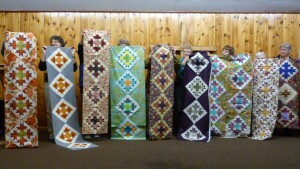 I had a wonderful time last October teaching at Ocean Waves Quilt Camp on the Oregon coast, just north of Tillamook. 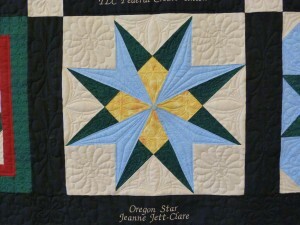 Quilt Camp is an annual event organized by Jane Wise the owner of Jane’s Fabric Patch quilt shop in Tillamook. My good friend Nancy Watts is a regular attendee at this annual event and suggested I contact Jane about teaching. If you are looking for a quilting get-away with three days of workshops from a wide variety of teachers, this is a great opportunity in the beautiful location of Twin Rocks Camp. 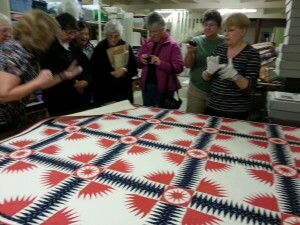 There were about eight teachers and 85 attendees. 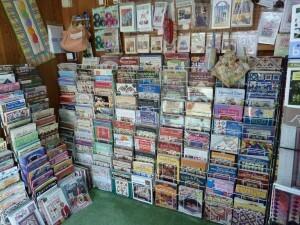 Here we all are. Jane in her hot pink jacket is in the front center. 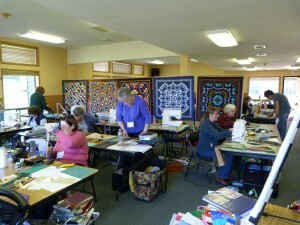 I taught workshops on all three days. 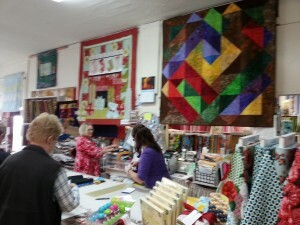 Here’s my classroom during Bargello Quilts with a Twist. On the other side of the partition, Peggy Gelbrich was teaching and the photo on the right shows some of the beautiful pieces her students made in her Swinging on a Star class. 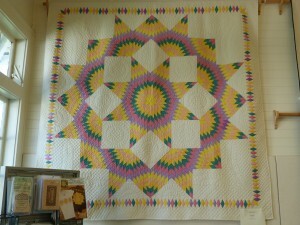 Here’s a couple of Bargello block arrangements from students in my class. On the Christmas one, the cardinal is fussy cut to go in the center of the four middle blocks. 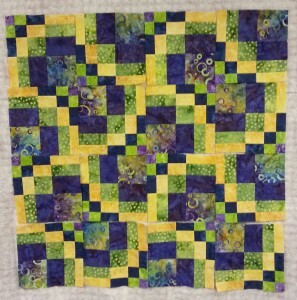 The blocks look great. 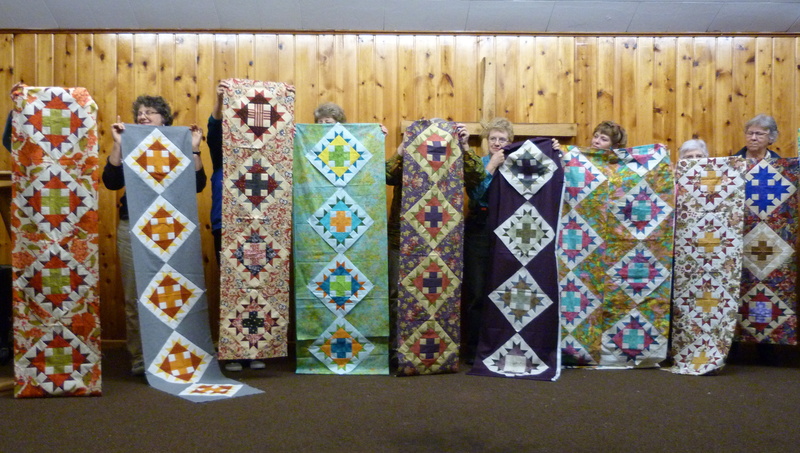 On the last night, we had show and tell. 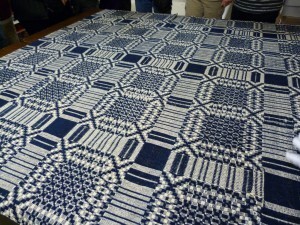 Nancy took these pictures of some of my students displaying their projects. 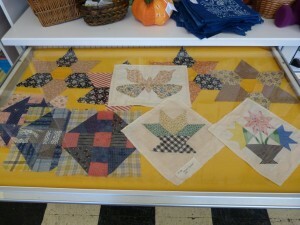 It was fun to see everyone’s work. 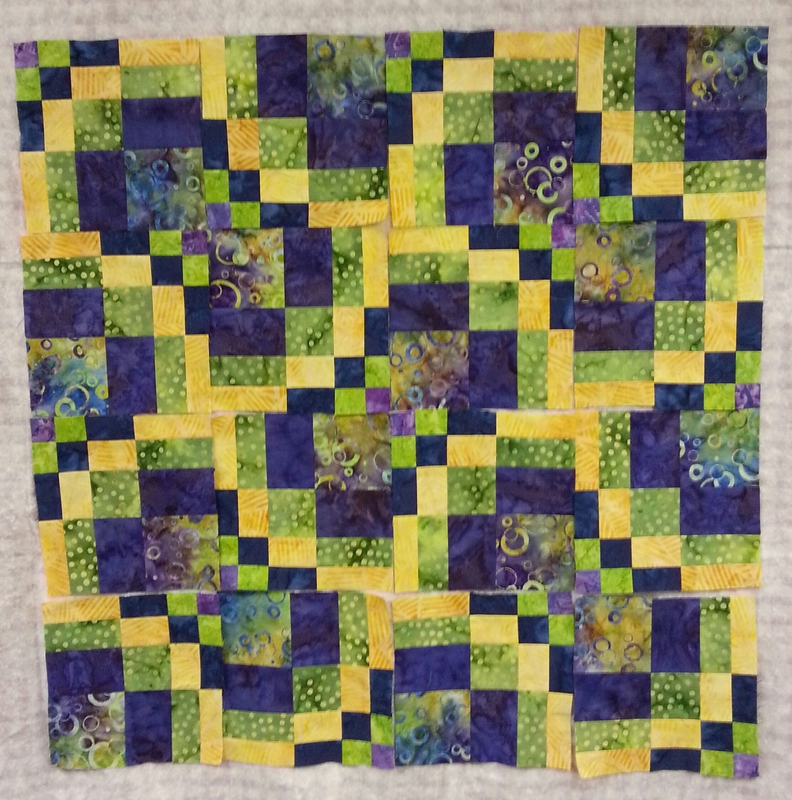 A couple of my students did study hall for a day after taking the Kaleidoscope Puzzle class, so they made great progress with their larger pieces. 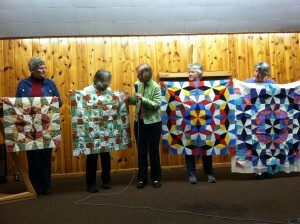 I enjoyed seeing projects from other classes too, and several people brought completed quilts from previous quilt camps. 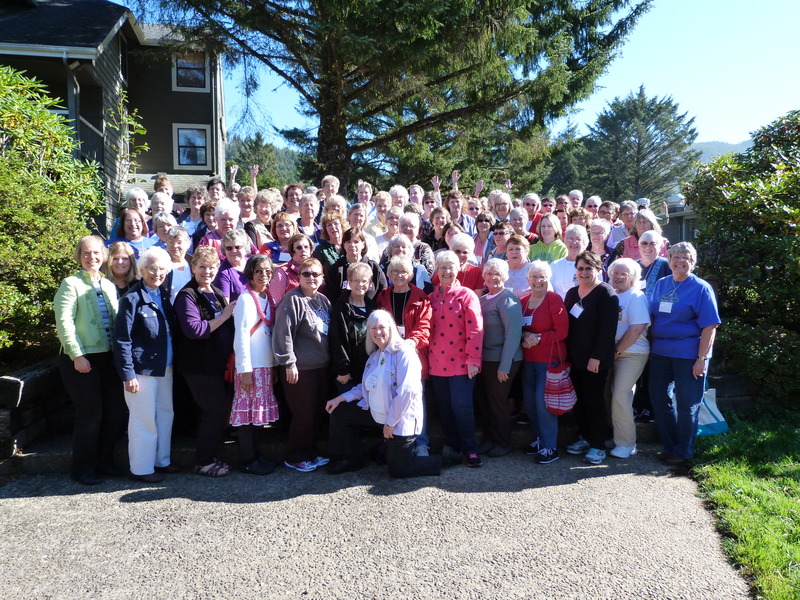 It was a wonderful grand finale to an action packed three days of fun (including jokes read out by Jane at every meal and many door prizes). 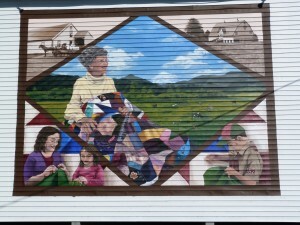 As an added bonus, the food was excellent. 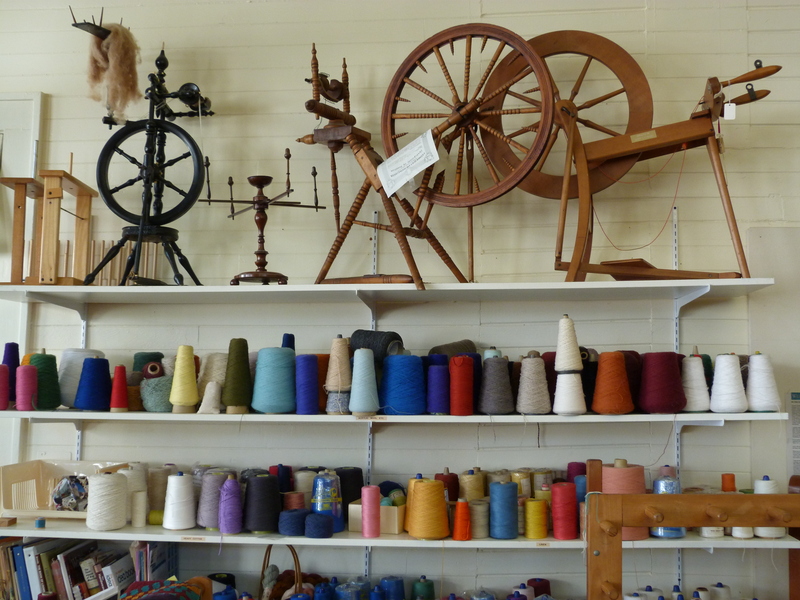 I can highly recommend this camp and I know that Jane will welcome you as will all the regulars who have been attending for years.